Dr. R. Ajay Dass, D.D.S. For years, the silver/mercury-amalgam was the standard filling material used in dental practices. Most practices still use it. While they are an economical restoration, amalgams do not look natural, giving the teeth a gray color, while often causing cracks and fractures of the teeth due to properties of amalgam. Brighton Dental Group offers our patients state-of-the-art restorations that are tooth colored and contain no metal. They will look natural. Utilizing these modern restorations can decrease tooth cracking and the need for root canal treatment. Crowns are used to restore both anterior (front) and posterior (back) teeth that have been broken or are at high risk of doing so due to over-sized old fillings or fractures. In the past it could take weeks and multiple office visits to produce crowns that look and feel like your own teeth. Now, thanks to our purchase of a CEREC system by Sirona Dental Systems, we can produce most permanent crowns in-house in under an hour. 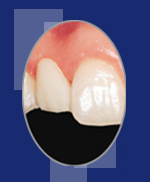 Inlays and Onlays are frequently used to restore teeth that are severely damaged by decay or wear. They are usually applied to the chewing surfaces of the back teeth. 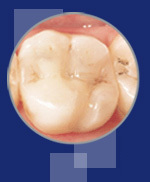 An inlay fits within the contours of the tooth. An onlay not only fits within these contours, but it also covers the chewing surface of the teeth. Bridges are state-of-the-art replacements of lost teeth. They naturally bring back total functionality, restoring the original anatomical design and beauty. Firmly attached they cannot be taken out, allowing you to brush them right in your mouth and give you the ability to be yourself every time you eat or drink. You can look and feel younger. When bridges are not an option, removable dentures can be crafted from superior materials to restore your confidence while eating, smiling, and talking. You or somebody you know can enjoy the pleasure and security of stable removable dentures. Dental implants offer a natural looking, comfortable, permanent solution to replacing missing teeth. Implants can also be used to replace a single missing tooth, support a bridge or secure a denture. Think of dental implants as metal anchors, usually made of titanium, that are surgically placed into the jawbone to hold permanent replacement teeth or dentures. Through a process called “osseointegration”, the jawbone actually attaches itself to the implant over time, providing tremendous stability. We are excited to offer this advanced dental restoration alternative to you. It is an important part of our commitment to help you keep a healthy, great-looking smile for a lifetime. At Brighton Dental Group, we value your opinion of our business. Please take a moment to visit our Google+ page and submit your review. Show Off Your Pearly Whites! Don't miss out on this special offer to get your teeth whitened! See how strikingly beautiful your new brighter smile can be! Take advantage of this great deal on teeth whitening. Only $375...a huge savings! Purchase a gift certificate to Brighton Dental Group and make someone smile!